180 Medical is a national leader in the intermittent catheter supply industry. We recruit employees who are hardworking individuals that want to enjoy going to work and are inspired to help people every day. We offer a very competitive benefits package, extensive training, and fun extras. 180 Medical was recently named one of the Best Places to Work in Oklahoma. We offer a variety of positions in different departments with opportunities for growth and development within our company. Today we are highlighting Megan, a Corporate Recruiter from our Human Resources department. Megan, how long have you worked for 180 Medical? Tell us a bit more about what you do in your position. I recruit top-notch sales representatives for our outside sales department. We fill positions nationwide, so I find candidates, educate them about our company, and work them through the interview process. It’s hard to pick one favorite thing! Overall, I love that I come to work and feel good. We have fun, work hard, help people, and push for success. It’s a great feeling. I started working here as a part-time receptionist while I was in college. Honestly, when I first started working here as a part-time receptionist while I was in college, I thought I would only be at 180 Medical during the summer. After about a year, I changed my degree path to Human Resources and was offered a position as the Human Resources Coordinator. This was a huge learning opportunity for me to really see how Human Resources worked. After working in the HR Coordinator role for 4 years, I was given the opportunity to try a new position in recruiting. 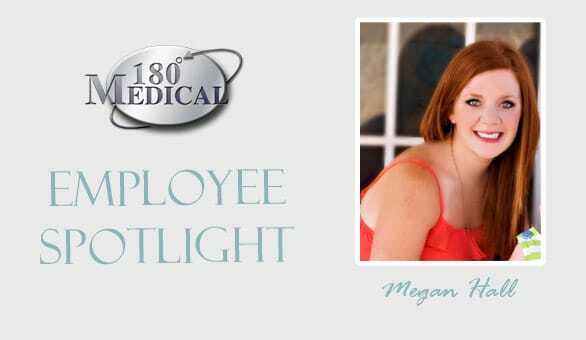 180 Medical gives employees amazing opportunities for career growth, and they offer us support to be successful. What do you feel sets 180 Medical apart from other employers? The company bobblehead is something that all employees look forward to. On your 5th anniversary with 180 Medical, you are awarded a personalized bobblehead. They are designed with the employees’ interests and personal characteristics in mind. It’s a unique way to show appreciation to employees and looks great on your desk. What’s your favorite part about recruiting employees for 180? The best feeling is adding someone to the team that you know is a perfect fit for 180 Medical’s positive, friendly culture. Thank you, Megan, and all of the amazing workers in Human Resources. You’re such a big part of making 180 Medical such a fun place to come to work!